It’s Perfect for Small and Special Quilt Projects! Are you looking for a simpler way to finish a quilt? A knife-edge binding isn’t actually a binding, as no extra fabric is used. Instead, excess fabric from the top and back are folded under to create a neat finish. You often see knife-edge bindings on antique quilts. They can be used to good effect on modern quilts as well. This finish is perfect for when you don’t want a lot of bulk or a different fabric around the outside edge. It creates a nice flat finish for the edges of a quilt. 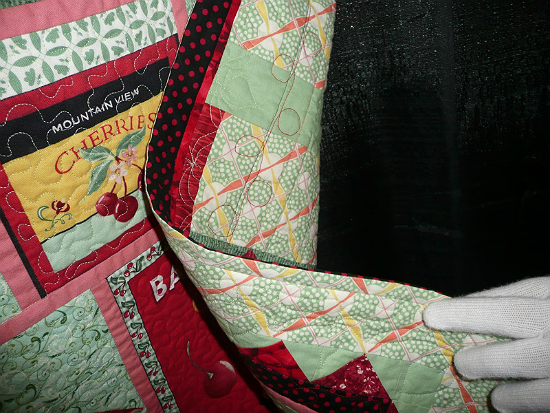 “Cherry Pie”, made and quilted by Jackie Hillman. See more of the quilt here at Come Quilt. Just keep in mind that this type of finish is not as strong as a regular double-fold binding. Don’t use it on baby quilts, bed quilts or throws that will be washed often. However, it’s perfect for wall hangings, pot holders, table runners and more. It’s an especially nice finish for quilts with irregular edges, like hexie quilts, too. This is an simple way to finish a quilt, although you do need to hand sew around the outside edge. The following articles explain how it’s done. Each one goes about it a bit differently so we encourage you to review them all. “How to knife-edge finish your quilts” from Today’s Quilter. 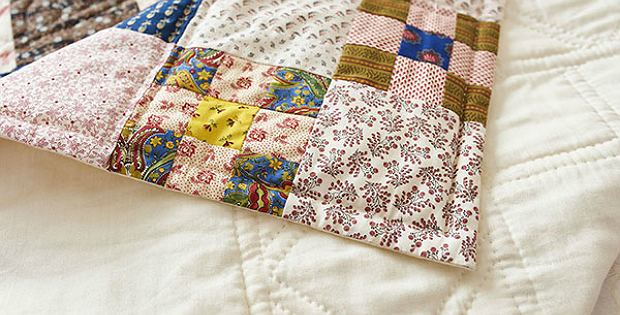 “Learn How to Sew Knife Edge Quilt Binding” from The Spruce Crafts. “How to Sew a Traditional or Knife Edge” from Welsh Quilts. Between the three variations you’re sure to find a method that works well for you.